(BPT) – It’s time to grab the tongs and apron because it is officially grilling season. You’ve waited months to reclaim your rightful position behind the grill, and it’s finally time to achieve your goal of making this your best grilling season yet. Now, you need a game plan. To take your place as the rightful master of the grill this year, consider following these five barbecuing tips. * Keep it clean. It may be the least glamourous part of your grilling experience, but keeping your grill clean is essential to delivering a quality product. A stiff wire brush is just the ticket along with plenty of oil once you’re done. Then, turn up the heat and enjoy preparing your meal on a clean, hot surface. * Direct and indirect grilling. Many summer chefs aren’t familiar with these terms, but mastering direct and indirect grilling is a great way to bolster your cooking skills. Direct grilling cooks the food directly over the heat source and is perfect for smaller, thinner pieces. Indirect grilling cooks the food near the heat source – but not directly over it. This is good for larger, thicker items. * Don’t fill the grill. A loaded grill is a mouth-watering sight but it jeopardizes the end result. Keep your grill at least 30 percent free so you have space to move food when the eventual flare up occurs. * Use the right tools. When it comes to rotating food, a reliable set of tongs beats a barbecue fork any day. Puncturing meat allows juices to escape prematurely, so don’t stab your food with a fork and never press burgers with a spatula. * Sit before you serve. For the best flavor, let your newly cooked meat sit for about 10 minutes before serving. The meat will be juicer and everyone will enjoy the meal a little bit more. Ready to take your grilling game to the next level? Creativity and having the opportunity to experience new tastes and flavors is arguably one of the most rewarding aspects of grilling season. 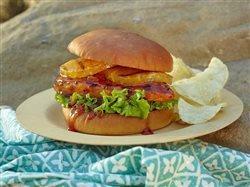 To get you fired up for the season ahead, the team at King’s Hawaiian has offered up this one-of-a-kind chicken sandwich recipe your family and friends will love. Made using their new brand new line of Hawaiian-inspired barbecue sauces, this sandwich is sure to be a mainstay at your seasonal events. And for more recipes visit http://www.kingshawaiian.com/recipes/. Grill chicken. As chicken is cooking, use a basting brush to glaze each side of the chicken with King’s Hawaiian Big Island Lava BBQ Sauce. Toast King’s Hawaiian hamburger buns over indirect heat. Build your sandwich: Bottom bun, mayo, lettuce, tomato, chicken, sesame seed garnish, extra King’s Hawaiian Big Island Lava BBQ Sauce, top bun. Is your teen ignoring you or is it hearing loss?